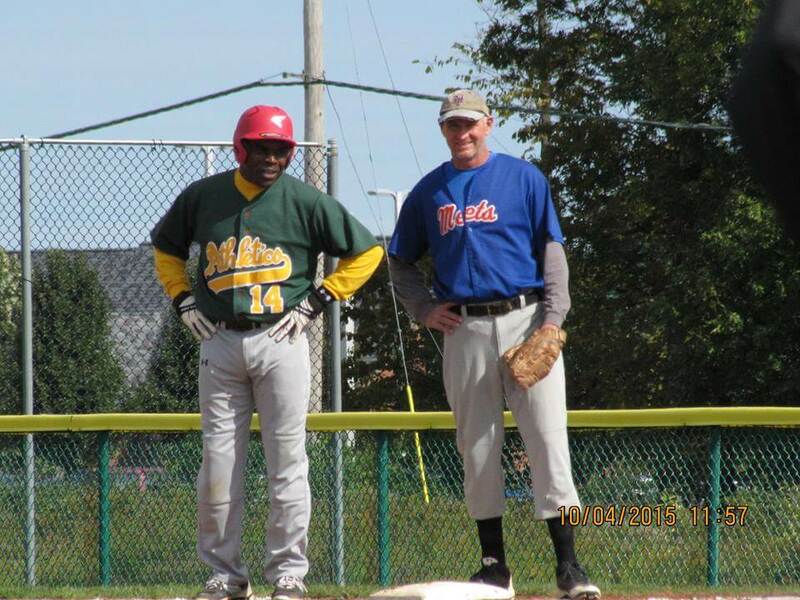 “Don’t go soft, play hardball!” The Rochester Men’s Adult Baseball League needs a few good men. When biking or walking on the path behind the Harley School in Pittsford, I have often seen men in their mid-20s and well beyond playing spirited games of baseball. On open fields around town, we are used to seeing recreational softball games, often late into the night at Cobb’s Hill. A while back — with some winter chill still in the air — I saw some guys practicing on the Brighton High School baseball field off Winton. As I pitched, played shortstop and batted cleanup in the 1976 Brighton Little League All Star game (all downhill from there) and have played a decades long game of fungo, I gladly accepted their invitation for a workout. Yes, hardball in Rochester. The Rochester Men’s Adult Baseball League was established in 1989 as part of a nationally associated league established in 1988. 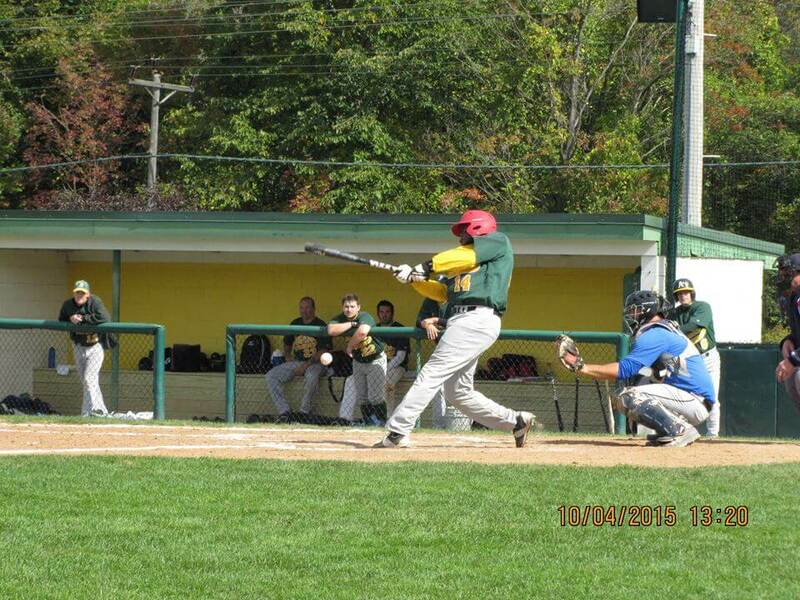 The games are played at local high school and college fields, including Gates HS, the Harley School, MCC, SUNY Brockport and even games at Muck Dog Stadium (AA ball club) in Batavia and Doubleday Field in Cooperstown. The regular season starts in early May and runs through Labor Day with playoffs in September. 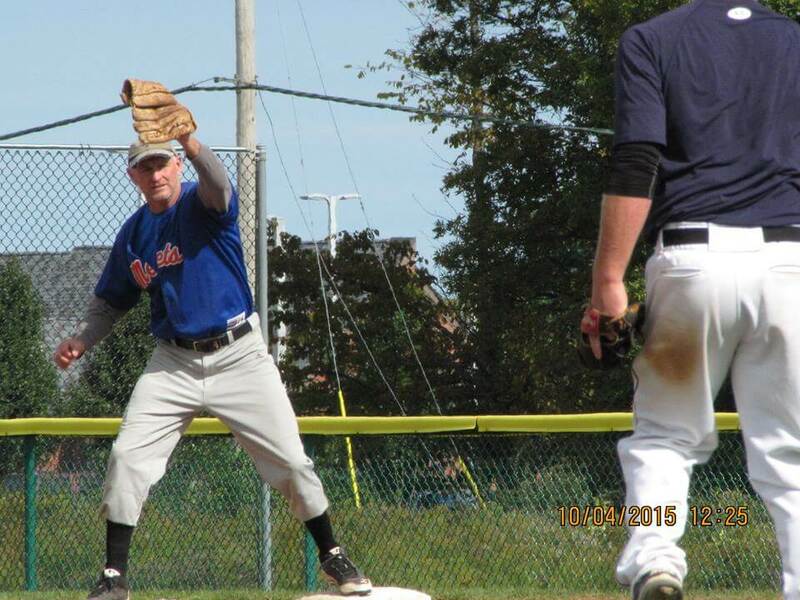 John describes the league as an alternative to softball. Most of the players participated in baseball in high school and quite a few in college. While the leagues is open to all skill levels, on occasions the league has seen former Triple A and even major league players. Unfortunately, opportunities are limited for those with baseball in their blood (good old fashioned hardball is not the usual faire at the company picnic or church social). So the league was founded for those who — in keeping with its motto — don’t want to go soft. At our workout, I met guys from their 30s into their 60s. I could tell they knew the game: hitting the cutoff man, backing up on grounders, and throwing with accuracy to make up for a little lost mph’s on the radar gun. 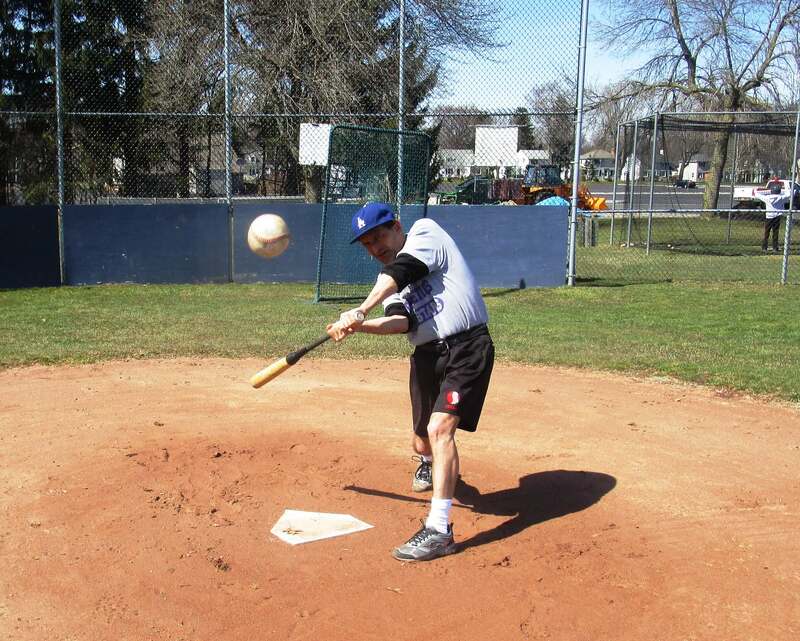 While I mainly play softball at the Sunday pick up game down the way at the Twelve Corners school, after a bit, I felt the baseball mechanics returning. Quickly, as we took batting and pitching practice — no arcs allowed — I saw what the guys found so appealing in the RMABL, and why they think baseball is the real thing. John says it’s not at all too late to get involved. The RMABL is always looking for a few good men. As John emphasizes — and I witnessed — the players are from all ages (25+) and skill levels. What they have in common is the belief that getting older doesn’t necessarily mean going soft. 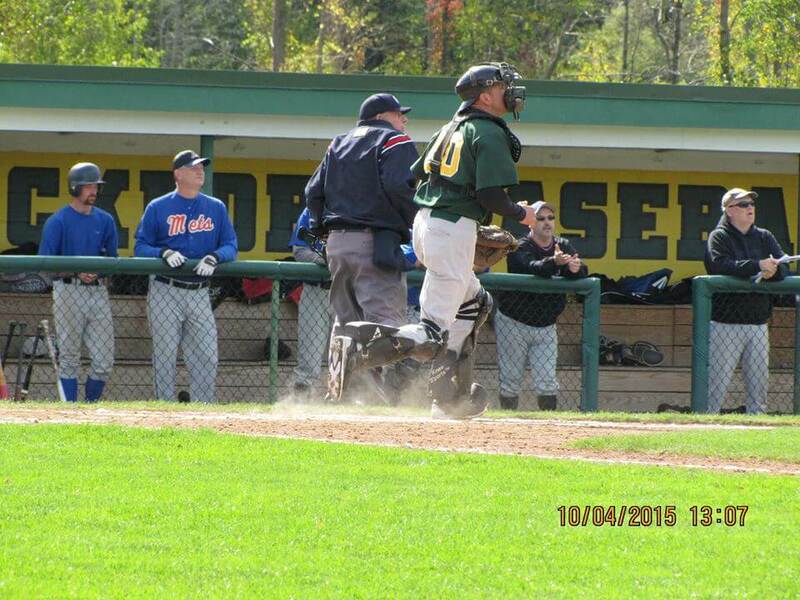 The pictures are from the 2015 championship game between the Mets and the A’s played at SUNY Brockport. 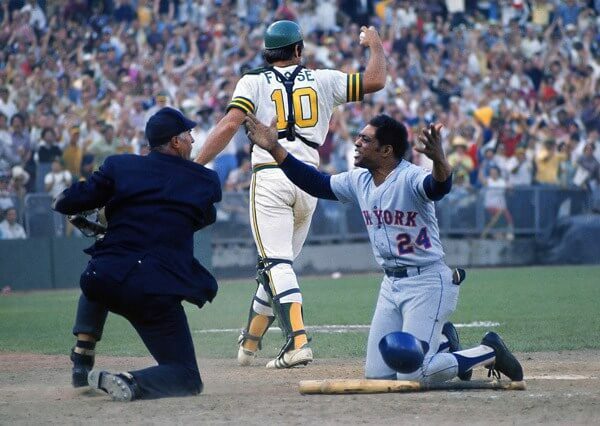 The matchup brings back memories of the 1973 World Series between Oakland and New York. 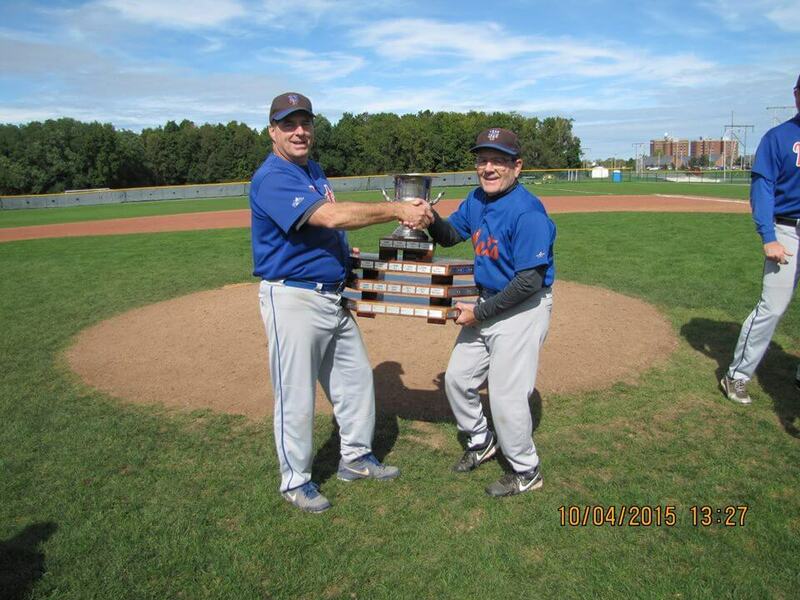 That Met holding the trophy could pass for Yogi Berra. 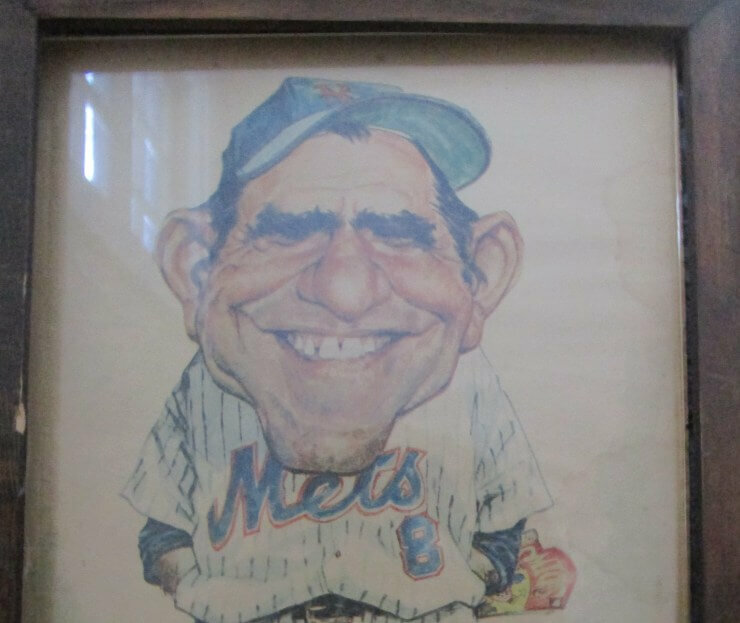 No doubt many of the players remember Willie Mays waiting on deck to pinch hit as the potential tying run in the bottom of the 9th if Wayne Garrett reached base. But Garrett made out and Mays never got his final swing. 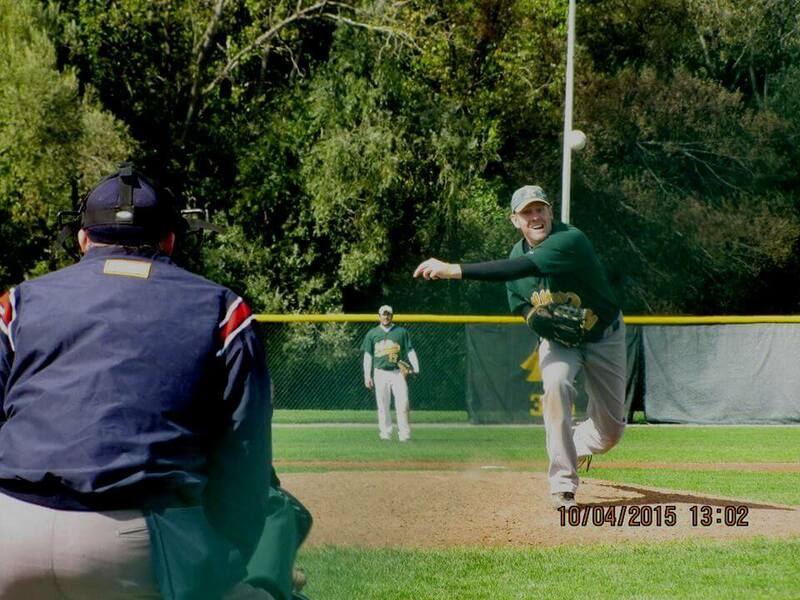 Of course, it’s not too late for Willie to join the Rochester Men’s Adult Baseball League!